Not to be confused with Sudan (region). 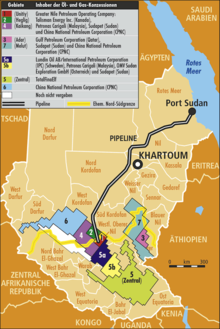 The Sudans (sometimes also known as the two Sudans ) is a region in Africa comprising the countries of Sudan and South Sudan. Sudan is situated in northern Africa, with a 853 km (530 mi) coastline bordering the Red Sea. Possessing an area of 2,505,810 km2 (967,499 sq mi), it is now the third largest country on the continent (Sudan lost it status as the largest country in Africa to Algeria when South Sudan became independent on 9 July 2011) and the fifteenth largest in the world. The Sudans lie mostly between latitudes 3° and 22°N (the Wadi Halfa Salient and disputed Hala'ib triangle are north of 22°), and longitudes 21° and 39°E. The terrain is generally flat plains, broken by several mountain ranges; in the west the Jebel Marra is the highest range; in the south is the highest mountain, Mount Kinyeti Imatong (3,187 m or 10,456 ft), near the border with Uganda; in the east are the Red Sea Hills. The Blue and White Nile rivers meet in Khartoum to form the River Nile, which flows northwards through Egypt to the Mediterranean Sea. The Blue Nile's course through the Sudans is nearly 800 km (497 mi) long and is joined by the Dinder and Rahad Rivers between Sennar and Khartoum. The White Nile within the Sudans has no significant tributaries. The amount of rainfall increases towards the south. In the north there is the very dry Nubian Desert; in the south there are swamps and rainforest. The Sudans’s rainy season lasts for about three months (July to September) in the north, and up to six months (June to November) in the south. The dry regions are plagued by sandstorms, known as haboob, which can completely block out the sun. In the northern and western semi-desert areas, people rely on the scant rainfall for basic agriculture and many are nomadic, travelling with their herds of sheep and camels. Nearer the River Nile, there are well-irrigated farms growing cash crops. Desertification is a serious problem in the Sudans. There is also concern over soil erosion. Agricultural expansion, both public and private, has proceeded without conservation measures. The consequences have manifested themselves in the form of deforestation, soil desiccation, and the lowering of soil fertility and the water table. In May 2007, it was announced that hundreds of wild elephants had been located on a previously unknown, treeless island in the Sudd swampland region of (then) southern Sudan. The exact location was being kept secret to protect the animals from poachers. ^ "In 2 Sudans, Familiarity With Path to War". ^ "Big fight over a small place". ^ "Country Studies". Country Studies. Retrieved 26 June 2010. ^ "Dept of Forestry, University of Khartoum". Unu.edu. Retrieved 26 June 2010. ^ [unreliable source?] Staff writer (n.d.). "Sudan — Environment". Encyclopedia of the Nations. Retrieved 13 January 2011. ^ Wheeler, Skye (28 May 2007). "Elephant Herds Found on Isolated South Sudan Island". Reuters. Retrieved 13 January 2011. This page was last edited on 31 December 2018, at 19:33 (UTC).